Check out Tobi's Layla Velvet Plunging Maxi Dress Turn heads at prom in the Rose Layla Plunging Velvet Maxi Dress. Featuring a front twist, plunging neckline, and a thigh high slit, without a doubt, you'll turn some heads. This elegant long dress will look even more incredible with neutral heels and a simple clutch. Turn heads at prom in the Plum Layla Plunging Velvet Maxi Dress. Featuring a front twist, plunging neckline, and a thigh high slit, without a doubt, you'll turn some heads. This elegant long dress will look even more incredible with neutral heels and a simple clutch. Turn heads at prom in the Rose Layla Plunging Velvet Maxi Dress. Featuring a front twist, plunging neckline, and a thigh high slit, without a doubt, you'll turn some heads. This elegant long dress will look even more incredible with neutral heels and a simple clutch. 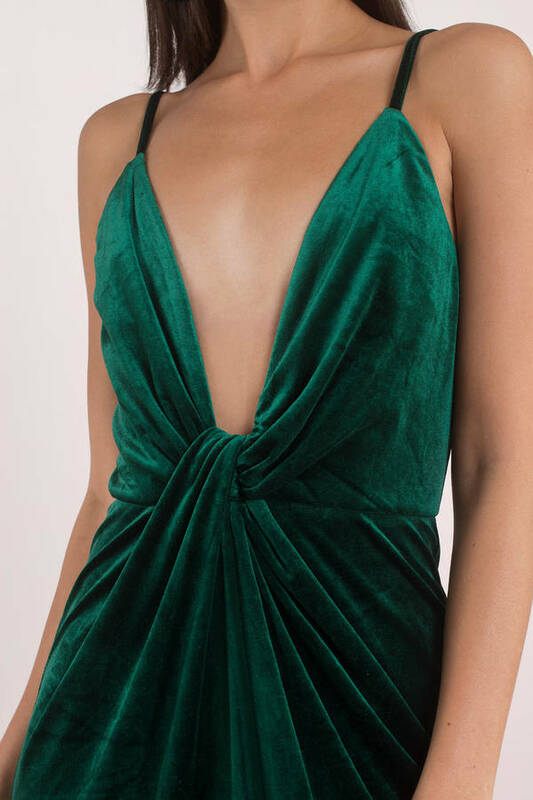 Turn heads at prom in the Emerald Layla Plunging Velvet Maxi Dress. Featuring a front twist, plunging neckline, and a thigh high slit, without a doubt, you'll turn some heads. This elegant long dress will look even more incredible with neutral heels and a simple clutch. Emerald, Plum, modeled on a size X-Small. Rose, modeled on a size Small.